It’s 6pm on a Monday night and I decide to tackle Nasi Goreng….not the brightest move. Drying shrimp paste over an open flame isn’t exactly what I had in mind after a long day but I’m so very glad I did because it was DELISCIOUS!! Nasi goreng is a very popular Indonesian rice dish. 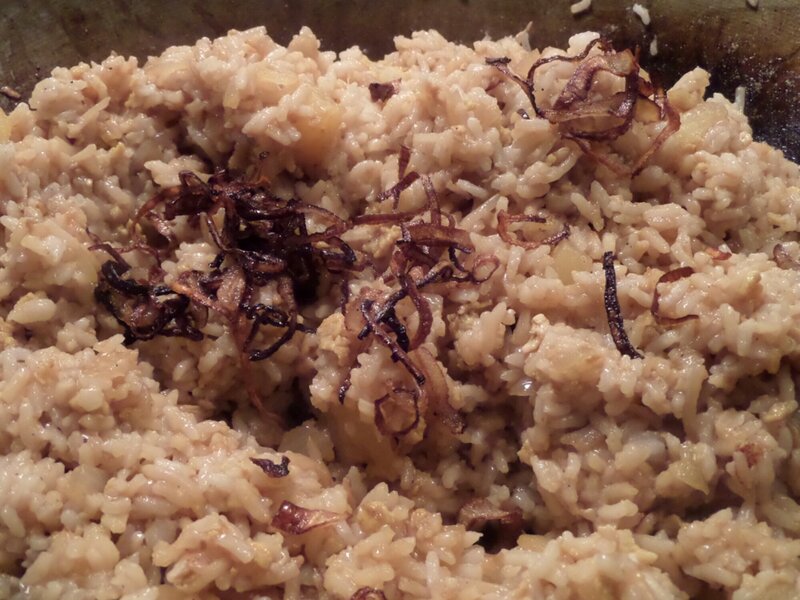 After pouring over 20 different recipes, there didn’t seem to be any right or wrong way to make this yummy fried rice. Want a fried egg on top? No problem! Want to make it with pork versus chicken? Why the hell not! Brown rice, white rice…it’s totally up to you. What is not negotiable is using “leftover” rice. As with any “fried rice”, using day-old rice is key. 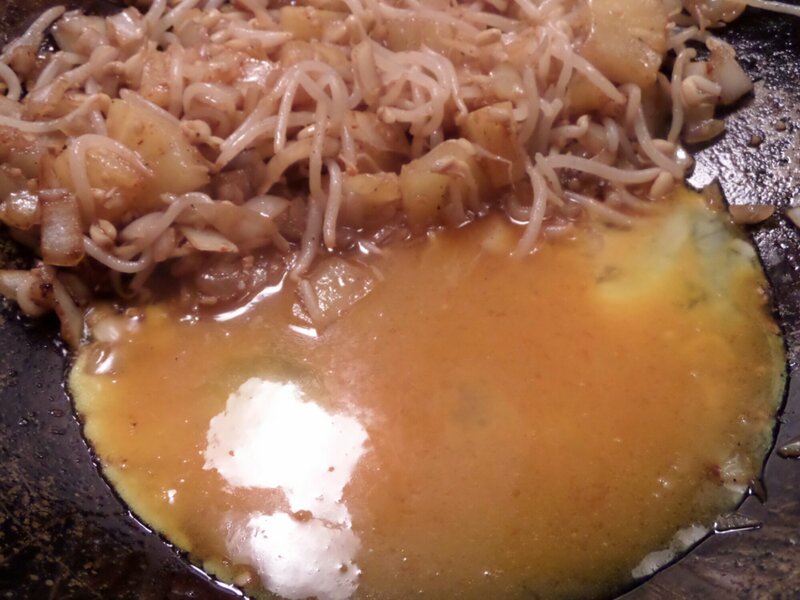 If you were to make up some white rice and then throw it into the wok, you’ll end up with a mushy mess. If it’s refrigerated overnight, it dries out and is the perfect texture to be the vehicle for some yummy sauces. That being said, I am not a planner. I am certainly not organized enough to say, “Hey, it’s Sunday! How about I make rice, put it in the fridge and then make Nasi Goreng tomorrow night?!’. Just isn’t going to happen. Thankfully, there’s a trick for people like me. It involves a baking sheet, oil, less water than you’d usually use to boil rice and cold New England nights (OK, the fridge also works). For rice, the rule of thumb is 1 part rice to 2 parts water. I went with 2 cups of plain old white rice and a little more than 3.5 cups of water. Be sure to rinse the rice really well! I added 2 Tbl of vegetable oil to the pan and threw in the rice. Once it was thoroughly coated in the oil, I added the water and let it summer (covered) for 15 minutes. I then rinsed it again under cold water. 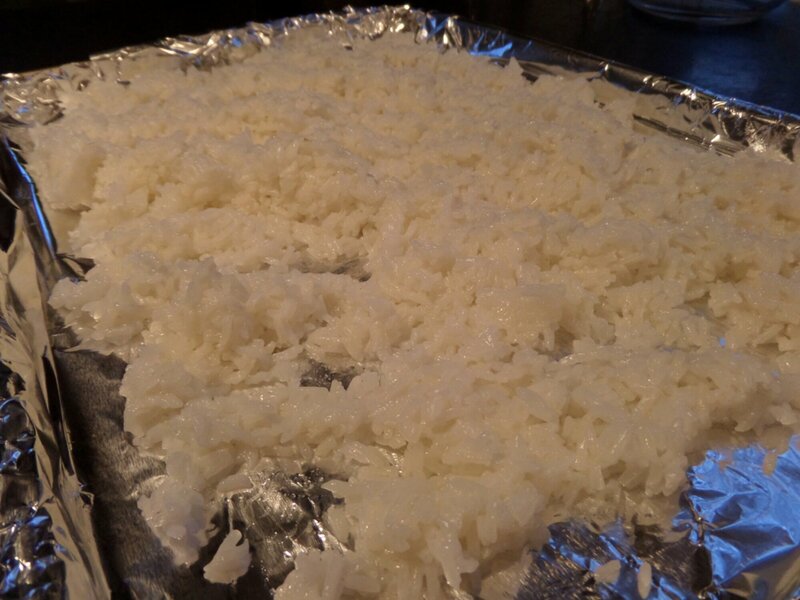 I lined the baking sheet with tinfoil and spread out the rice, breaking up any clumps. I let the rice sit in the fridge while I got everything else ready (a little over an hour….I wasn’t exactly moving at the speed of light). 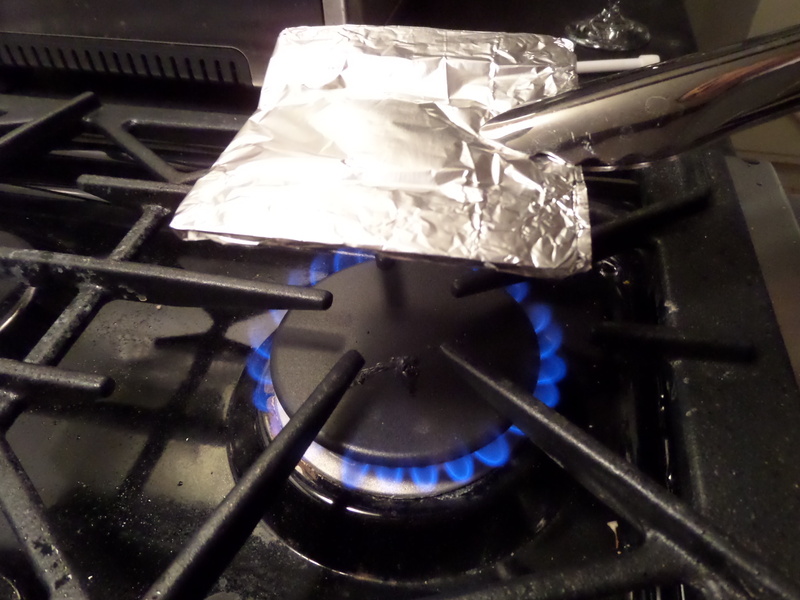 All you have to do is add the paste to tinfoil, wrap it up in a little packet, grab some tongs and hold it over the flame for a minute on each side. 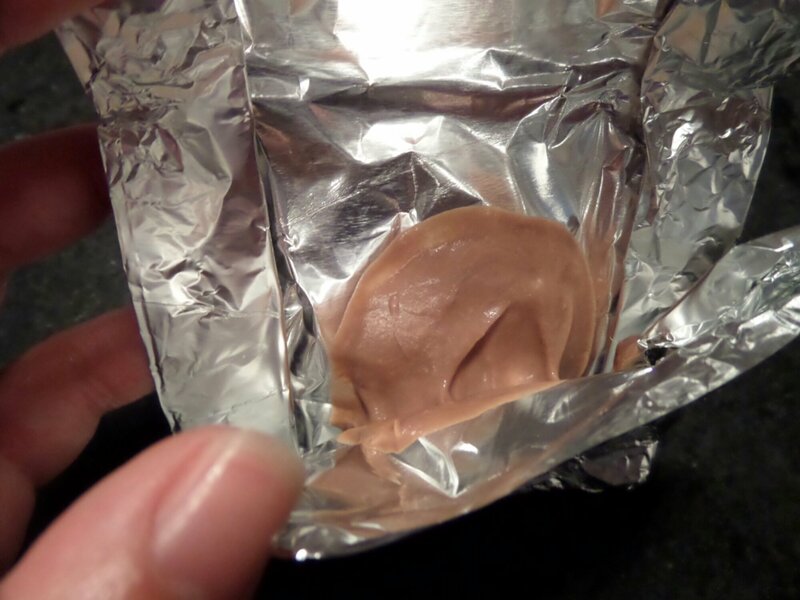 Once it reaches maximum stinkiness,set it aside to cool. 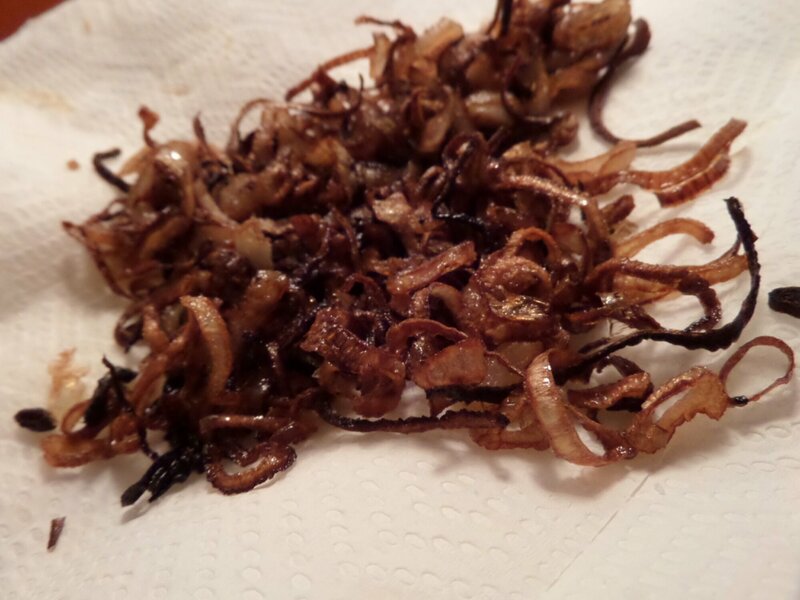 Next came the “frizzled” shallots (who knows what frizzled means….it should be called exactly what it is – FRIED shallots). I sliced them thinly, heated about an inch of oil up to 350 degrees and quickly fried them in batches. 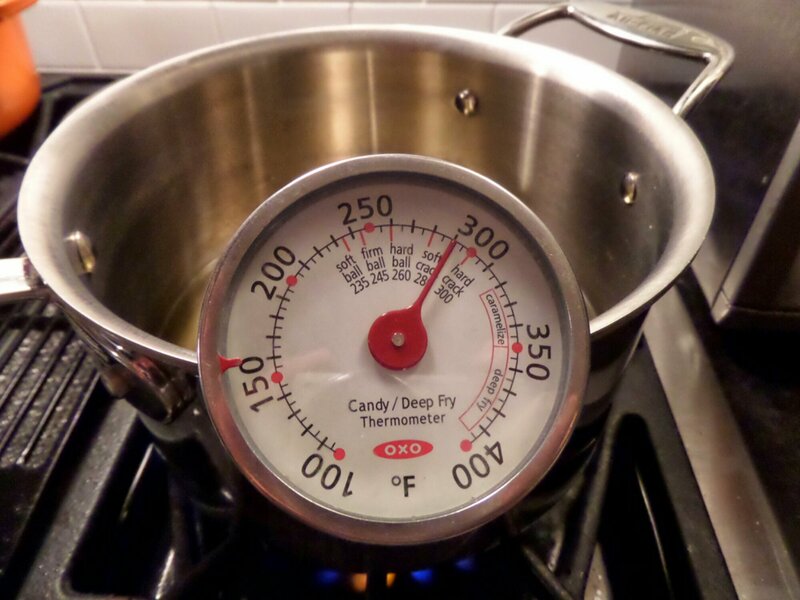 A little tip from me to you, the first batch will be charred in seconds so once the oil reaches 350, turn the heat down a little. As soon as they’re golden (again, this happens fast! ), put them on paper towels to drain. I diced an onion and set it aside. I did the same with some ginger and garlic. Next came the eggs. I beat two eggs and added the sesame oil and salt. Lastly, I made sure I had everything else (soy sauce, brown sugar, etc.) at the ready because cooking with a wok is like driving a 100 mph. After rinsing / boiling / rinsing the rice, spread it out on the baking sheet and put it in the fridge. 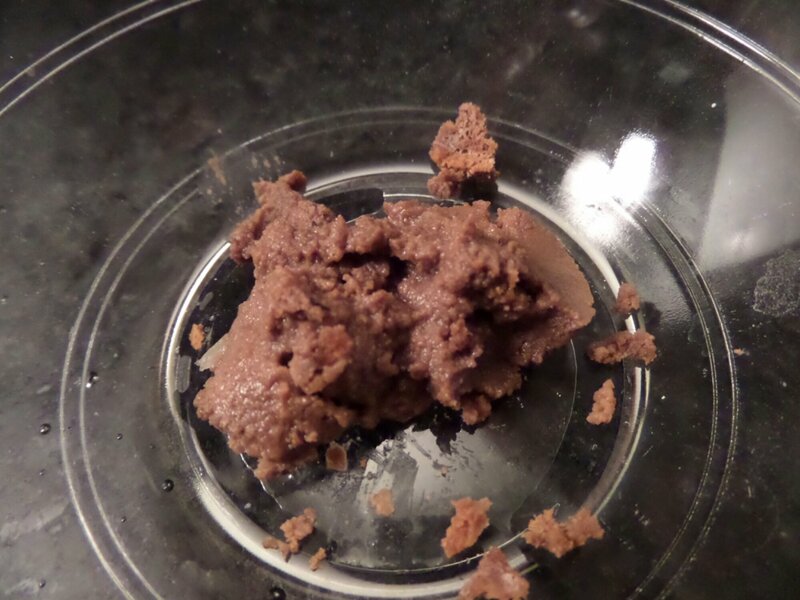 Dry the shrimp paste (see above) and set it aside. 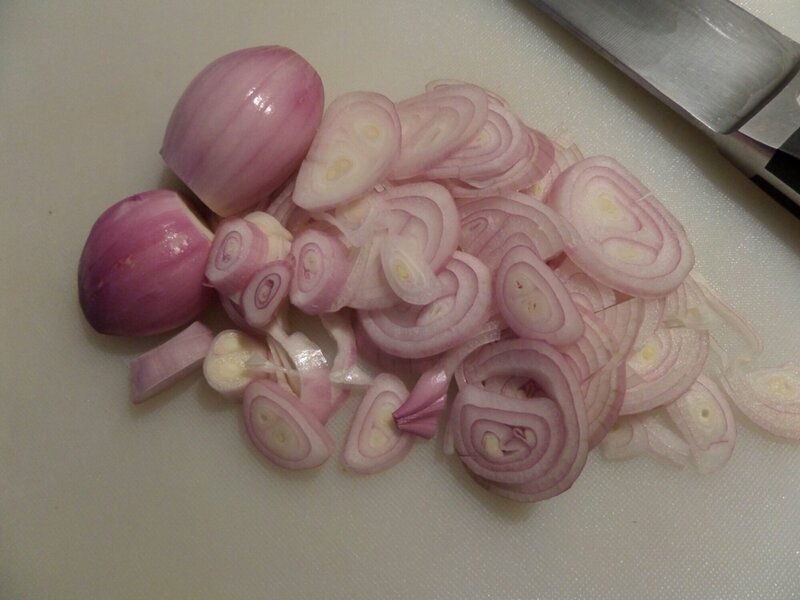 Dice the onion and shallots. 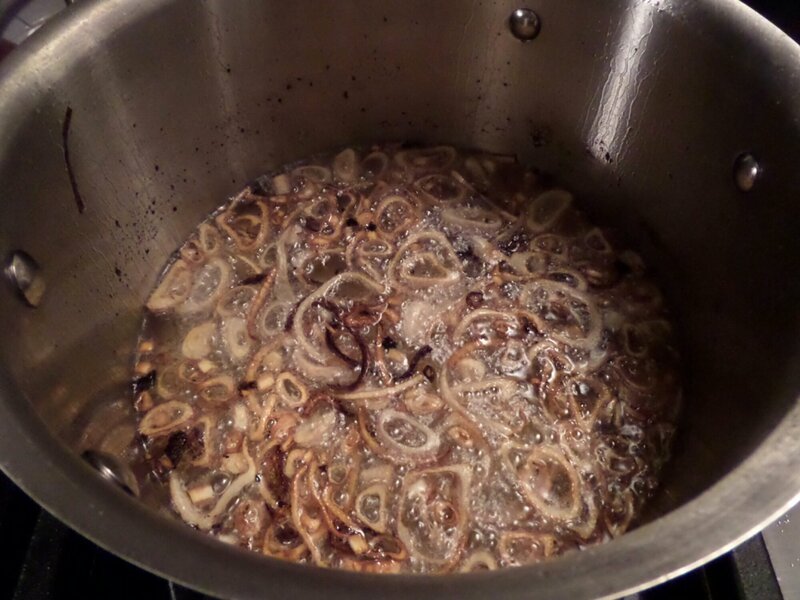 Quickly fry the shallots and set them aside. 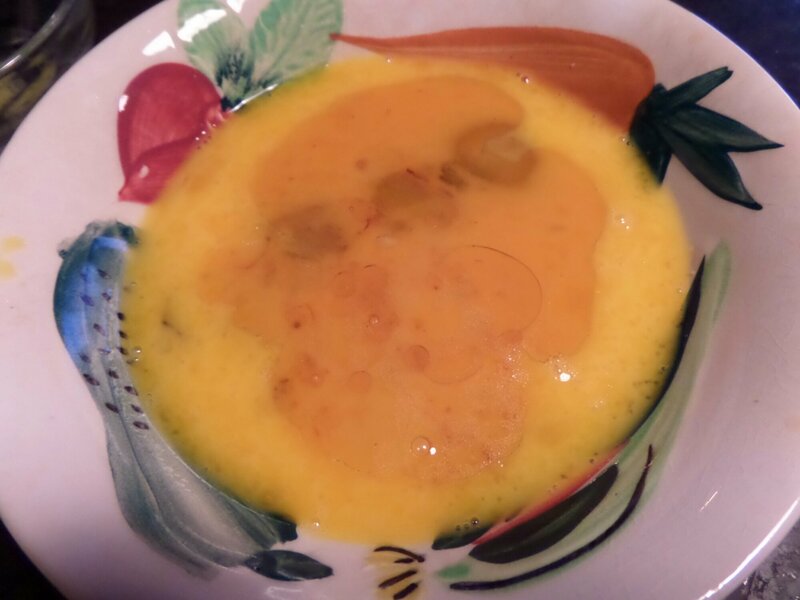 Combine the eggs with the sesame oil and salt. Coat the wok with oil and add an additional 2 Tbls. Heat the oil over medium-high heat until it just starts to smoke. Add the onions and stir for 2-3 minutes. Add the paste and stir well. Next add the garlic, ginger and brown sugar. Stir for another 2 minutes. 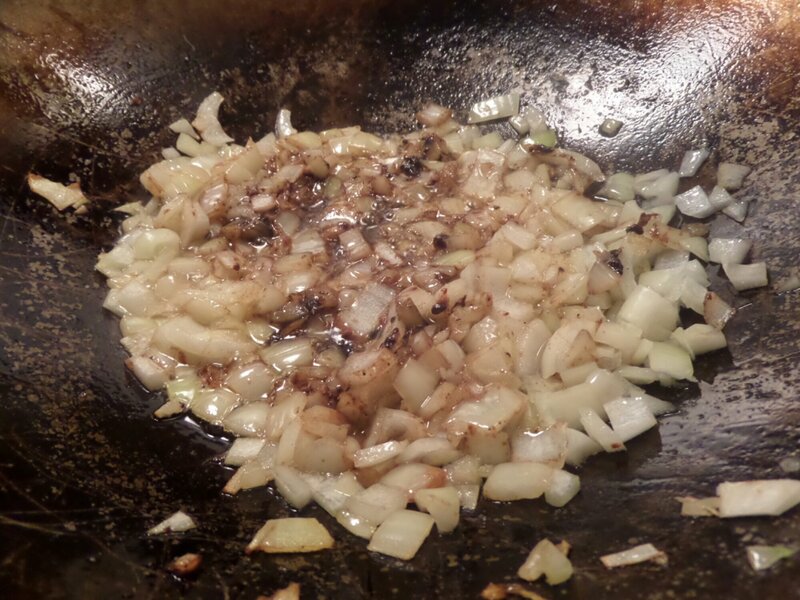 Push the onion mixture to one side of the wok. If you’re adding protein, throw it in at this point. Once cooked, also push it aside and add the eggs to the other side. Scramble them and then add the rice. Keep stirring constantly. Add the soy and the chili bean sauce then stir for another 5-6 minutes until the rice is thoroughly heated. Garnish the rice with scallions and the fried shallots. DONE! And the leftovers were even better the next day! I didn’t have any pretty scallions on hand so you are not allowed see my finished product. Just trust me when I say it was damn tasty! !